The number of rhinos which have been killed in South Africa has more than doubled in the last four years. Official figures show that 100 have been killed in the past month. Since January this year, 790 animals have been killed, compared to 333 in 2010. The government declared rhino poaching a national security risk, and a national priority in 2011. It says it is now working on an agreement with other African nations to help protect rhinos from poaching. South Africa is home to around 80% of the world's rhino population, estimated at more than 25,000. People kill rhinos for their horns which are worth a lot of money. The horns are used in medicine or for decoration in some parts of the world - particularly south east Asia. But scientists say there's no evidence the horn has any medicinal benefits. 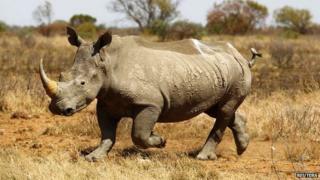 Conservationists have warned the increase in rhino poaching in South Africa is becoming critical. They say that now, with more rhinos being killed than born, there is a risk the species will start to decline.